As an Auburn alumnus, I have been a fan of the Auburn University athletic teams and have noted that the Auburn Athletic Department has not gone to the lengths that the athletic departments of other universities to celebrate the accomplishments of its football teams. For example, while the NCAA Records Book recognizes Auburn as a national champion for the 1913 season, the Auburn Athletic Department only notes this in a footnote of the media guide. This past summer, I saw in the news that the University of Minnesota had decided to claim a college football national championship for the 1903 season because it was chosen as such by a noted retroactive selector. Then later this summer it was noted that Texas A&M University has decided to claim two additional national championships for similar reasons. Being quite familiar with the history of the Auburn football program, I knew that there were seasons other than 1957 and 2010 for which Auburn could legitimately claim a national championship. 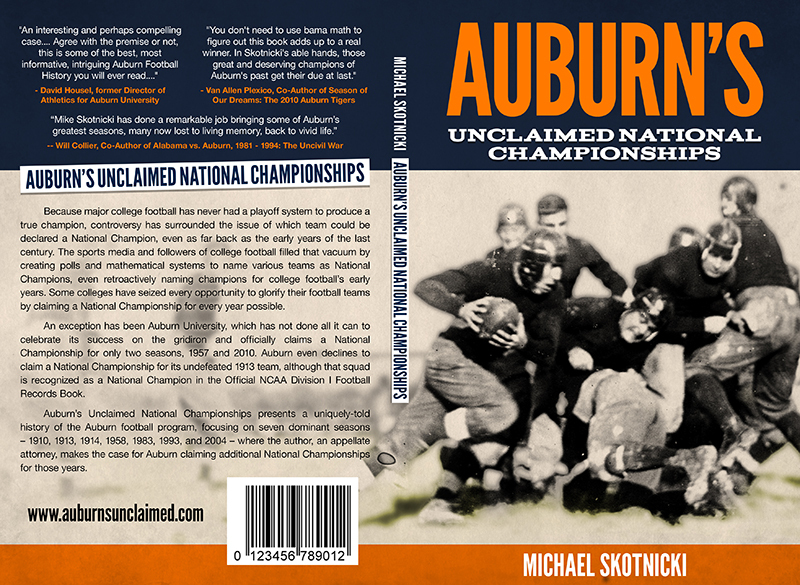 So, I decided to write about that topic and it became a book which has just been published, Auburn’s Unclaimed National Championships. The book is available for purchase through the web site www.auburnsunclaimed.com, which then has a link to the subsidiary of Amazon that is the publisher. This should be a great book for all Auburn football fans. For those who follow this blog for legal writing tips, I’ve been busy with the book and other projects, but will soon be back to updating this blog.